It wasn’t until 2013 that I really got into canning. My mother is a canning guru and I enjoyed the benefits of her knowledge and skills. I’d send off a basket full of dirty raw carrots and receive back perfectly canned carrots. Although I saw no real problem with this arrangement, I did think it was high time to learn the magical art of canning. Let me start by saying that until recently, I thought canning was just canning. I didn’t realize there were different kinds. I’m hedging my bets that a few of you are just like I was: unaware. Today we are talking about water bath canning. Water bath canning is just like it sounds. You are bathing the cans in water versus pressure canning where you use steam pressure to can. 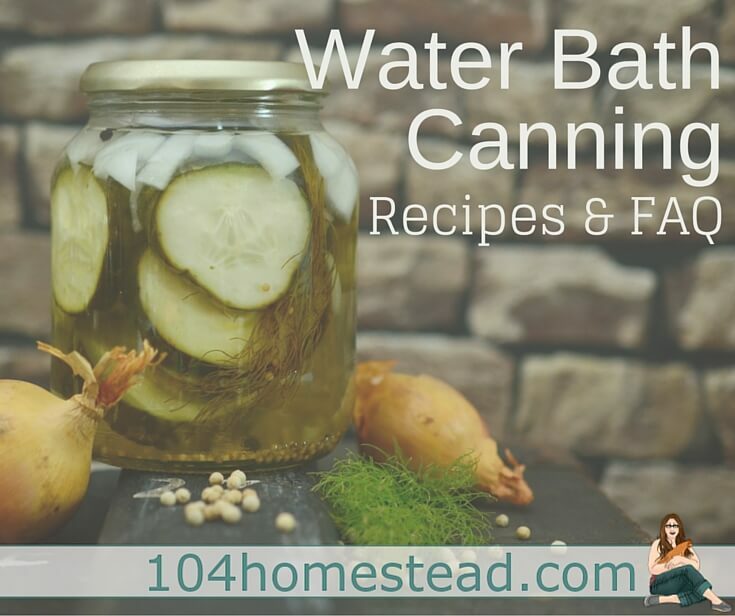 I personally think water bath canning is the place to start when you are first learning. You don’t necessarily need a fancy pot and there is no risk of blowing a lid through your kitchen ceiling (just kidding… for the most part). I’ll admit, I was a bit nervous when I canned for the first time independently. People throwing around a word like botulism does tend to unnerve you. I really didn’t want to be a headline in the paper. Honestly, though, it’s really not that hard. If you have someone in your life who is willing to mentor you, spend some time canning with them. If you don’t have a mentor, check for local classes. My friend Kathie at Homespun Seasonal Living offers classes in her community and I’m sure there are others. If you can’t find an actual person to teach you, Ball’s Blue Book Guide to Preserving is like the canning bible. According to my mother, Guide to Preserving comes out annually and you should always get the latest edition because canning practices (such as changes in canning lid procedures) are always evolving. I used the Ball Blue Book Guide to Preserving to make spicy pickles yesterday all by myself. Do I have to use a special canning pot for boiling water bath canning? Any large pot will do, but canning pots make life a bit easier. The bigger the pot, the better it maintains a constant temperature. Can a pressure canner be used on a flat-top stove? It depends on your stove and the pot you are using. Pots with rippled or textured bottoms don’t make good enough content to heat properly. Some stove burners areas aren’t large enough to handle the space needed for a canning pot. Can I double stack jars in a water bath canner? You can, but use caution. Adding that many cool cans to the pot may cause the temperature of the water too much. The time it would take for the water to get back up to temperature may result in mushy canned goods. Can food be re-canned if the lid doesn’t seal properly? Canned food can safely be re-canned if it’s done within 24 hours. Remove the lid and check the jar-sealing surface for imperfections. Use a new lid and reprocess. Can I only can things I’ve grown? What is hot packed? What is raw packed? Raw-packing is using uncooked food. In the case of pickles, raw packing preserves crispness. Hot packed foods are boiled and cooked before canning. Carrots are a great hot packed food as they soften before being canned. Proper headspace allows for proper vacuum sealing. Too little headspace and the contents of the jar may bubble out. Too much head space and prevent the jar from sealing. If kept in a cool, dark, dry location, canned foods last for about a year. Here is more information about how long you can expect your canned goods to last. Since I am new to all of this, I am directing you to the people I deem professionals. Many thanks to all the wonderful bloggers with canning experience who are sharing with us today. This canning kit from Granite Ware is a perfect for starting your water bath canning experience. It has all the essentials you could need. There is a 9 piece set that includes a 21-quart canner, canner lid, jar rack, 9″ colander, lid wrench, funnel, tongs, jar lifter, and magnetic lid lifter and a 12 piece kit that contains a 7 1/2 quart blanching pot with lid and drainer insert. I urge you to give canning a try. It is so rewarding and it’s a great skill to be able to pass on. If you are anything like me, you will spend hours gazing lovingly at your cans all lined up in a row. Happy canning! What is your favorite food to can? Love the imagined headline. Thanks for sharing on the Homestead Blog Hop. I’m new to canning but I love the canned tomatos I did recently! My just learned spaghetti sauce!! It’s hard to pick just one favorite thing to can…..but I think stewed tomatoes….and my grandma always canned corn and tomato juice…sooooo good! I have only canned Jams, but I really need to start venturing into more areas! But, seriously, I can’t wait to share this post with my readers! And check out the recipes, too. I’m always looking for something new to can! Strawberry jam made by my grandma is the best. She’s going to teach me how to make it. I’d love to win so I could make it. I just started canning this Summer – tomatoes form our garden, garden cucumbers turned pickles, and today Beautyberry jelly. I really love foraging for free food to can! Muscadine grape jelly will be next. 🙂 I can’t wait to learn pressure canning, beef stew, chili, green beans – yum! My favorite canned food has got to be tomatoes. I love canning and eating and cooking with tomatoes. My favorite is canned sweet potatoes! Thanks! Jellies of all kinds through the summer! Looking forward to fall weather to get in high gear with veggies and meat and soups! My favorite would have to be my mom’s apple-pear jelly made from apples and pears right from her backyard! Havent started canning yet, but really want to so I can make my own pickles ! This 74 year old woman wants to learn to can. Been looking in thrift stores for supplies but not much to pick from. Would love to win as would everyone else I’m sure. I love to open a jar of tomatoes in the middle of winter and smell the wonderful summer aroma. I haven’t canned since I was a child cannin with my mom. I would love to be able to do this with my own daughter! Hello,, I would love to win, this water bath caner. Your recipes look lovely, I want to try them all. I love it all! My favorite is probably pickled habaneros. I love to can anything. Today I did a giant double batch of pizza sauce. Yummy for my family. I need to repeat that at least two more times as we ran out last year. My favorite canned food are probably tomatoes. I love tomatoes in a lot of things. My favorite canned item is homemade jam, have canned various flavors. There is some really nice recipes on here thank you! My favorite canned food is stewed tomatoes. I use them in everything! 🙂 I was supposed to learn how to can this year, but my tomatoes didn’t produce, and neither did any of my family or friends’. Boo! Homemade jams and jellies. Especially good was some grape jel from winegrapes (Frontenac). Mmm. Elderberry jam sounds divine, not to mention good for you. We can everything we can get our hands on! Love our home canned garden goods, jellies, jams, applesauce/pie filling and we just made prickly pear jelly, might be my new favorite 🙂 Seven kids here so canning is not just a passion but a MUST! My favorite canned food is almost any fruit spread. Especially apple or peach butters and strawberry jam. My favorite is my jams and jellies! Ooooh sauerkraut! I could use a good recipe for that! As the prices of foods go up, I am canning more and more. Just keep running outta jars! most definitely… canned tomatoes! Love fresh tasting tomatoes all year round and use them in so many of my dishes… not to mention one of my favorite memories from childhood was when my mom would fix tomatoes and dumplings with tomatoes the family had canned…yum! I love to can and try something new every year. I love canned white half-runner beans!!! Hard to choose just one!!! Today I think my answer will be wild cranberries! My favorite is pickled peppers!! Fav. canned food is peaches! YUM! These are awesome recipes. Need to try the elderberry apple! I can also use a new canner after 31 years! I have never canned before but really want to learn! I love canning pickles, but my favorite is dilly green tomatoes. Just started canning this year. So far all I’ve canned is peaches, but I LOVE peaches. Canned Venison is my favorite! Green beans are definitely my favorite! I could not live without canned tomatoes in the Winter! I love canned green beans, carrots oh heck I love everything canned! I love canned strawberry jam. My wife and I love canning. We have started caning before we got married. We have only tried peaches and pears but are slowly branching out to more foods. My Wife and I love canning. We have been canning peaches, pears, and nectarines for the past three years. This is a hard one for me as I a few. But asparagus is my favorite right now. My husbands as well. Can’t be store bought canned, it has to be home canned. I LOVE canned food, but my favorite is ANY kind of jelly! Great collection of recipes, Jess, and thanks so much for including mine! My favorite canned food right now is bread and butter pickles!